Could you explain what "buffer" does in the Voronoi dialog i.e. what does the number stand for? The Voronoi polygons tool has an option to set a buffer region. This is the amount by which the resulting polygons will extend beyond the perimeter points. Just adding this figure with different buffer regions to Joseph's clear answer. 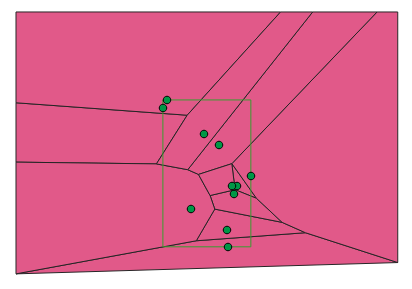 The buffer parameter of the Voronoi polygons tool in QGIS Processing is supposed to provide the increase of the boundingbox of the point layer in percent. But there seems to be something wrong with how it is used. 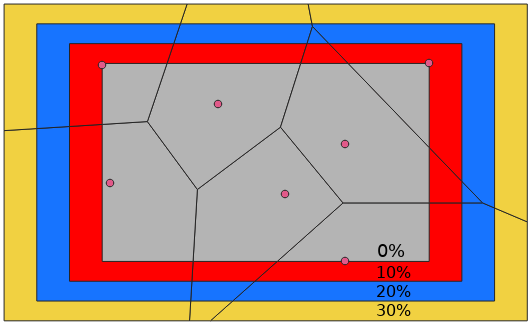 As far as i can tell, the horizontal "buffer" is calculated from the vertical size of the bounding box of the point layer as reference (for both the right and the left side), while for the vertical "buffer" is calculated from the horizontal size of the bounding box of the points layer for the top part, while something strange is used for the bottom. See the illustration below where buffer was set to 100 (%). Produced with QGIS 3.2. Not the answer you're looking for? Browse other questions tagged qgis buffer voronoi-thiessen or ask your own question. How to do Manhattan Voronoi on QGIS? What is math behind entropy calculation in ArcGIS Voronoi diagram? Which tool or plugin for Theissen / Voronoi polygons in QGIS? What does “Do you want to reset the field mapping” mean in QGIS Refactor Fields dialog?